Bloodhounds were perfected by the monks of St. Hubert(Belgium). They however were not created by them specificly. Bloodhounds were brought to England by the Normans, and from England to the United States. Bloodhounds were bred to be scent trackers. When hunting they mainly go for the hunt, not the kill. In the past they have been used to hunt animals, criminals, runaway slaves, and lost children. Today they are used as trackers and companions. Many hounds today are descendants of the ancient Bloodhound, such as the Bavarian Mountain Hound, Swiss Jura Hound, American Coonhound, Brazilian Fila Brasileiro, etc. 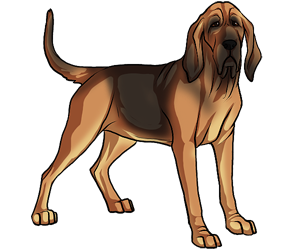 The Bloodhound is also known as the "Flemish Hound". Today the majority of Bloohounds are black and tan, or red, but in the Middle Ages, Bloodhounds were solid in color.